Decred is an open and progressive cryptocurrency with a system of community-based governance integrated into its blockchain. They printed five different kiss cut stickers in this run, and they all feature a custom design and message. 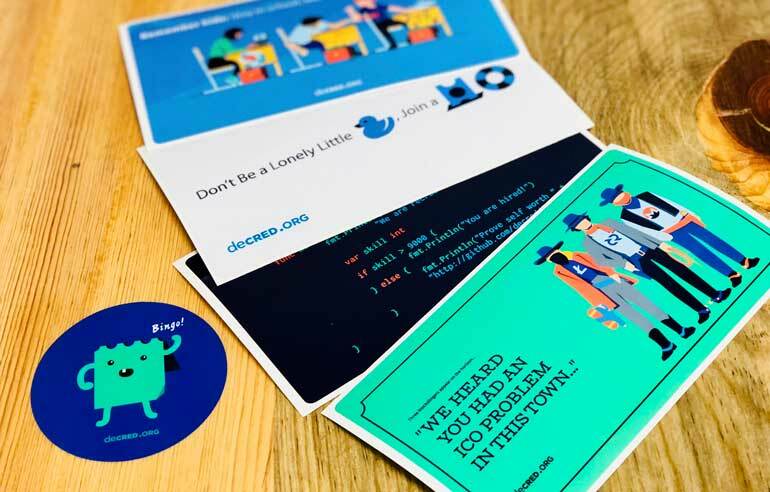 These promotional stickers help reinforce their brand and build community with inside jokes for folks in the cryptocurrency and blockchain worlds. Time for tech talk: Decred is a multi-platform digital currency with support for Windows, macOS, and Linux. Easy-to-use wallet apps enable sending, receiving, and mining Decred with just a few clicks. The Web Wallet is the easiest way to get started with Decred. All users can access it online via wallet.decred.org, without needing to download anything. Truly futuristic stuff that's starting to take over modern life, as bank fraud and identify theft affected 15.4 million consumers in 2016. And that's where Decred comes in: to provide currency management solutions for people who want more security and control over their digital money. Learn more about their technology on their resource page devoted to documentation. Now you might be wondering exactly what the terms cryptocurrency and blockchain mean, so let's answer those questions. A cryptocurrency (or crypto currency) is a digital asset designed to work as a medium of exchange using encryption to secure the transactions and to control the creation of additional units of the currency. So, basically this is a form of digital currency. Most people have heard of Bitcoin, the now eight-year-old currency that was the first decentralized cryptocurrency. Now spinoffs are entering the market and adding to the these "blockchains. "A blockchain is a piece of technology that is an "incorruptible digital ledger of economic transactions that can be programmed to record not just financial transactions but virtually everything of value," according to Don & Alex Tapscott in their book Blockchain Revolution from 2016. Our kiss cut stickers come on a backing that's slightly larger than the sticker, as you can see on the rectangles above. They stack well on a table at a tradeshow, and they are the perfect addition to any snail mail that gets sent out. Or say people come visit your office, why send them on their way with a fun parting gift like a sticker? For Decred, they're doing just that. If you're interested in using stickers like Decred, try us out.